The Parliamentary Secretary-Planning, AR, Personnel & Training, Chow Zingnu Namchoom, on Friday inaugurated three buildings including Double Storied Working Women Hostel, constructed under centrally sponsored multi-sectoral development programme (MsDP) in presence of R. K. Sharma Deputy Commissioner Namsai . 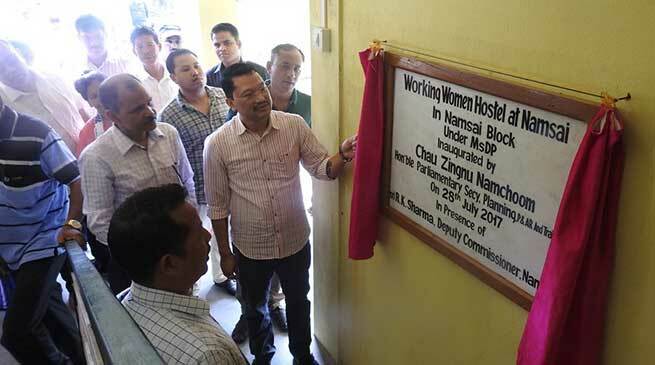 While inaugurating the “Double Storied Working Women Hostel” at Namsai HQ the Parliamentary Secretary expressed satisfaction that the single women Govt staff staying in rented houses will not only find accommodation in this building but also companionship of staff friends and can live like a family members and this will pave the way for a healthy working atmosphere in this newly created district. Inauguration of the “Building for additional class room” has fulfilled the long felt need at Govt Higher Secondary School at Lathow. While responding to public memorandum Chau Zingnu Namchoom reiterated his priorities for education and health Sector. R. K. Sharma, DC Namsai urged the school authorities to properly use & maintain the infrastructure giving utmost attention for its cleanliness. He urged upon the teachers and students to be disciplined in academic matters. He also requested the parents to share responsibilities in management of school and academic environment without which the desired results can’t be expected. In the evening, “Additional building of Public Health Center” at Piyong constructed under MsDP was also inaugurated by the Parliamentary Secretary in an impressive public meeting. While dedicating the three building for public use the Parliamentary Secretary appreciated the executing agency WRD for maintaining the high quality construction of the buildings under centrally sponsored MsDP scheme. The buildings have also been formally handed over to respective user agencies on the occasion.